Where There's A Meal, There's a Way - Ain't no thing, but a clean Chicken Wing! Ain't no thing, but a clean Chicken Wing! Mix dry spices together. Cover chicken wings with dry spices. 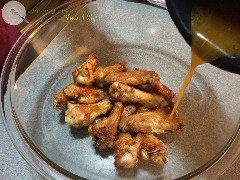 Place chicken wings in a gallon sized ziplock bag, pour melted butter and tabasco over chicken wings and mix well. Refrigerate for at least 20 minutes (I put mine in the fridge for 3 hours). Preheat oven to 250. 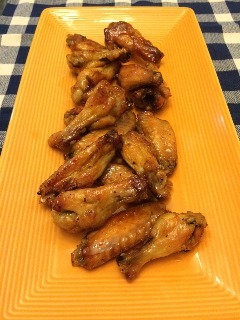 Place wings on a well greased baking sheet. 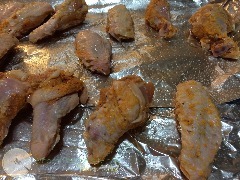 Place wings in oven and cook for 20 minutes. After 20 minutes heat oven to 425 and cook for 30 minutes. While wings cook, make your glaze. To make glaze, combine all ingredients in a small sauce pot until butter has melted. 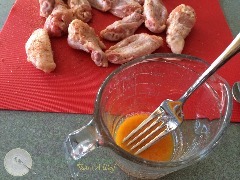 Place cooked chicken wings in a large bowl, and pour glaze over top and mix well. Return chicken wings to the oven and cook at 350 for 10 minutes. Let rest for 3-5 minutes and serve warm. Ok folks I have a confession, I hate chicken wings. Well, I've never actually eaten one, but nothing about a wing from a chicken screams "YUMMY" to me. Therefore for the rest of this post I am turning it over to my wing loving hubby, who this was lovingly made for! Clean Wings, now that's gotta nice ring. ​When Keleigh asked me how I liked my wings, my first response was sweet but not spicy. Being the great cook that she is, she knew exactly what I meant. The wings were cooked perfectly and the honey glaze provided a nice sweetness that was followed by a little kick from the tabasco. Before I knew it, I had devoured the entire plate. After finishing, I'll admit, there was a little heat in my mouth, but nothing any fellow football fanatic couldn't handle. If you looking to throw a hail mary this weekend, this is one recipe you will surely want to include because, where there's a meal, there's a way!